There I was, reading about the Westworld finale on Variety (don’t worry, no spoilers), when I’m offered six more articles to read. They all look pretty interesting, but only two actually have to do with TV, while the others are about fashion and celebrity. So, how did an ad for a Macy’s sale end up in my article about an HBO show about robots? The power of native advertising. Evidently, native ads are doing something right. According to eMarketer, native ad spending is expected to reach $8.8 billion by 2018—a jump from $5.7 billion in 2016. And fashion retailers are some of the biggest benefactors of this native ad boom. In fact, by digging into Adbeat’s data, we were able to pinpoint the most successful fashion retail marketers out there, and figure out five key tactics that they’re all using. Keep it simple, silly. It’s an old adage for a reason, and it holds true for native ad creative. Just look at the image above. If you’re launching a native ad, you’re not only competing with five or six other native ads, but also with other display or video ads, the actual content on the site, and probably a comments section. So, how do you grab your reader’s attention in just a few seconds or less? Pare down your catalogue and focus on just one product. Take SlideBelts, a leather belt retailer that redefined the accessory. Instead of featuring a whole closet of belts, they stuck to showing a single product with a white or gray background. This is easier for the reader to digest, since it only asks them to process one simple visual at a time. Athletic wear retailer, Fabletics, took a similar approach. While their third biggest native ad features several different products, their first and second only feature one—a pair of leggings. That single product image even outperformed a picture of celebrity co-founder Kate Hudson herself. Sure, this image can be effective. (Lust is one of the seven deadly sins of native advertising.) But, among their top four native ads, Fabletics spent $37.5k on ones with the leggings and only $10k on the others, which should speak for itself. Why should people care about your brand? Why should they click on your link instead of the next guy’s? When it comes to native ads, that’s the question you have to ask—and answer. They’re not just telling readers, “We’re awesome” or “You need to check out our product.” Instead, they’re saying, “We want to show you why you’ll love us. Click here and find out,” which can be much more effective. 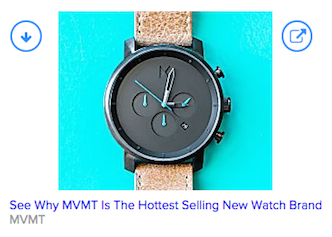 Following up on that “Why” question, brands aren’t exactly using native ads to say “Buy this now! !” Rather, they’re inviting customers to get a feel for the company and start looking around a bit. That’s why their ads don’t go straight to product pages for a specific new coat or handbag. Many are redirected to content-filled pages with text and visuals about the company. And if there is a call-to-action there, it’s not a buy button; it’s an invitation for the visitor to find or build the right product for them. 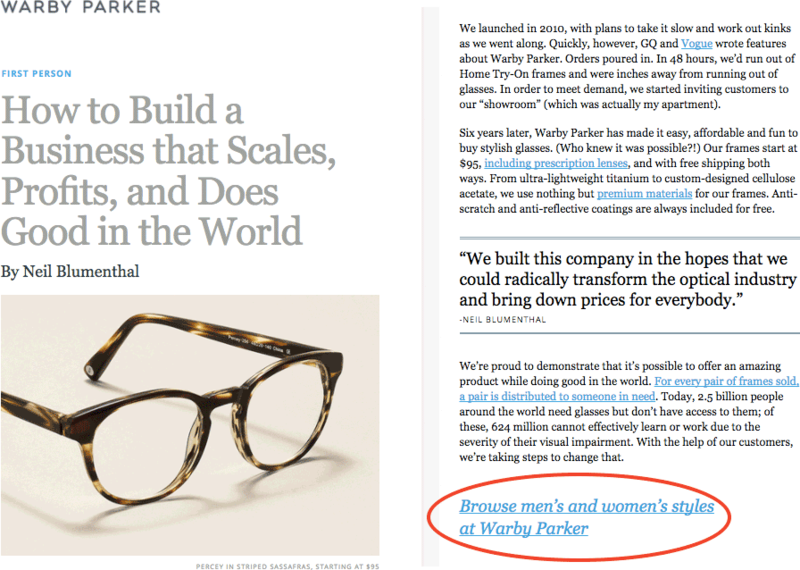 For instance, one of Warby Parker’s top ads says, “Glasses Shouldn’t Cost More Than an iPhone. That’s Why We Did Something About It.” If someone clicks through, they’re taken to a full-blown article about the founders. Only at the end are they presented with a call-to-action to check out the product. 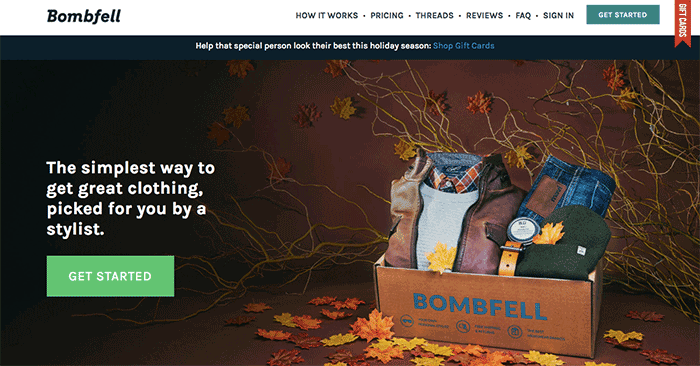 Bombfell, which sends clothes picked by a stylist right to your door, even takes visitors right to the homepage. Above the fold is a big “Get started” button. But below is an in-depth look at the company, including sections about how the service works, what to expect, and customer testimonials. Bombfell could’ve sent people to the “Threads” page, which includes pretty pictures of some of its clothes. Instead, the company went for a softer sell, making an effort to get customers on the site, and then let them look around for themselves. After I read that Westworld article this morning, I jumped to a “Huffington Post” piece about Donald Trump being named TIME’s Person of the Year. Below the text, I saw six more native ads. And this time, none of them had to do with the content I’d just read. Do you see any mention of politics in here? Me neither. The point is, native ads don’t always have to match the topic of the surrounding article. They don’t even have to match the content of the publication. After all, just because I’m reading about Trump, that doesn’t mean I need to only read about news and politics. Or just because I’m on “SB Nation,” that doesn’t mean I can’t enjoy a non-sports-related article or an ad about a cool new product. Take Gilt, a retail site with deals on top-name brands. Its most successful native ad placements are on Yahoo, Ranker, Mental Floss, and Daily Dot. Sure, some of these sites might host fashion content, but they’re not purely fashion publications like Vogue or Elle. Jewelry brand, Alex and Ani, also launches ads on a variety of websites, from ZAP2it.com and Weather.com to CBS.com and FoodNetwork.com. This may seem strange, but it’s evidently working. Think about it: If each brand limited their distribution pool to only publications related to their industry, they’d be severely cutting themselves short, and they’d lose out on exposure to millions of potential customers. 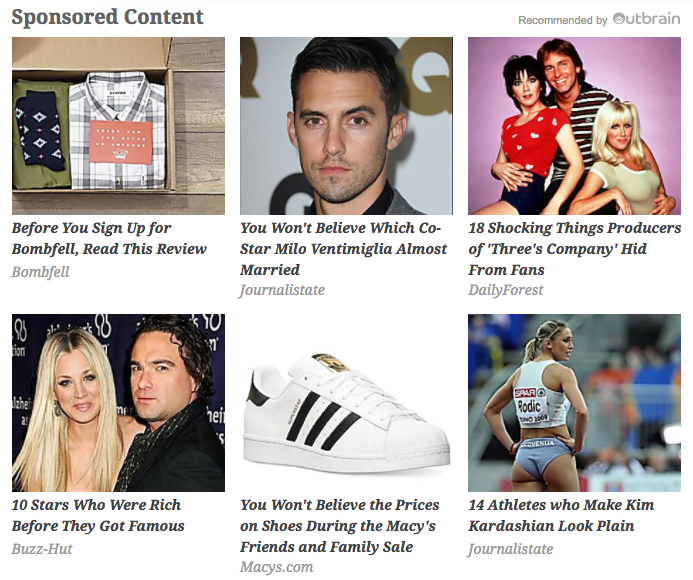 Native ads aren’t just for clickbait headlines from celebrity gossip sites (though, that does work extremely well). They’re also a powerful strategy for fashion retail brands that want to grab the attention of new customers. Still, as the native ad space heats up within the next few years, competition is going to get fierce. In order to be ahead of the curve, you’ll have stay on the latest trends and research the competition. And you can start now by using some of these winning tactics from top fashion retailers. 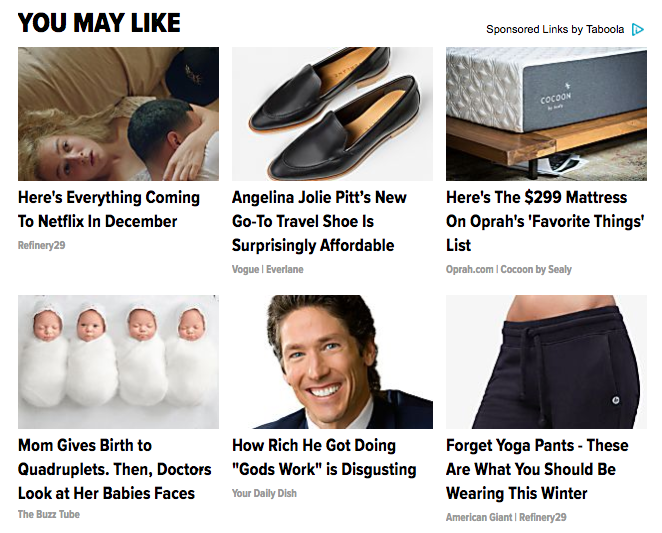 Native ads are powerful and on the rise, but unfortunately they are mostly trashy clickbaits. Do you want your brand next to those? Yes, it works very well, and I often get tempted to click on those “trashy” and/or “baitish” titles, but just out of curiosity. I’d prefer to buy from more trustworthy sources where there are no baits and catches.